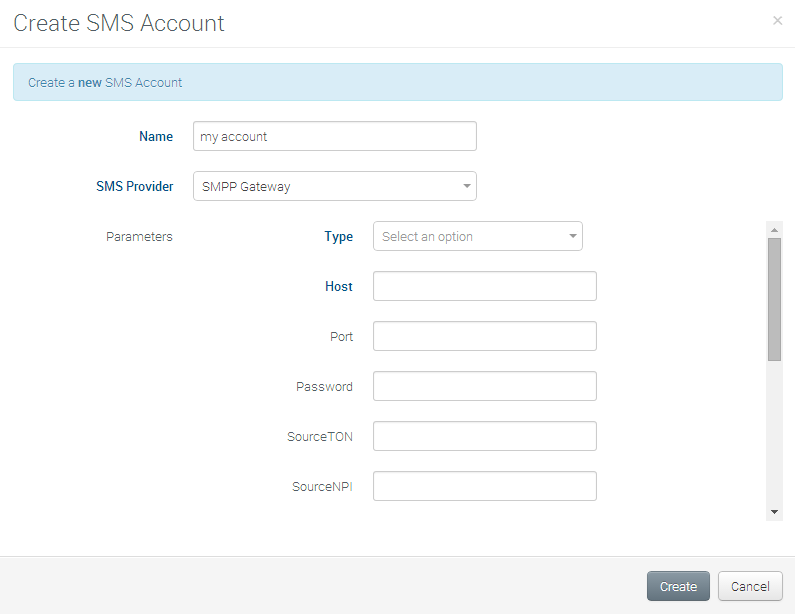 How to configure AirVantage to send SMS with a gateway using SMPP? This topic explains how to configure AirVantage to send SMS with a gateway using SMPP. The SMPP protocol (Short Message Peer-to-Peer) is the most commonly used protocol for short message exchange outside SS7 networks. AirVantage supports Versions 3.3 and 3.4 of SMPP. If you want to learn more about SMPP, have a look to the specification. Start by creating a SMS account from the Administration. Choose SMPP Gateway from the SMS Provider list. Choose a name and complete the form with the information provided by your SMS Provider. RX, TX or TRX. This parameter corresponds to the mode used by AirVantage to connect to the SMS Gateway. TRX can be used if you don’t have information from your provider for this parameter. IP address or host name of the SMS Gateway. TCP/IP port used to communicate with the SMS Gateway. There is no default port; you must get this information from your SMS Gateway provider. The username used to identify your account in the SMS Gateway. The password of your account in the SMS Gateway. May be required by your SMS provider to characterize an application or service. Can be left empty (default). TON is short form for Type of Number configured as sender address in your account. It must be provided by your SMS Gateway provider. If you don’t know this number you can set it to 0 (Unknown). NPI is the short form for Numbering Plan Indicator configured as sender address in your account. It must be provided by your SMS Gateway provider. Sender address configured in your account. It must be provided by your SMS Gateway provider. If the number provided starts with a ‘+’ then enter in this field the number without the + and set TON and NPI to 1. TON is short form for Type of Number used for destination address when AirVantage sends the SMS. This parameter has to be set to 1. NPI is short form for Numbering Plan Indicator used for destination address when AirVantage sends the SMS. This parameter has to be set to 1. Same value as Source address except if your SMS Gateway provider gave you a range of addresses: enter the prefix of the range as provided. Choose the version of SMPP that AirVantage should use to communicate with the SMS Gateway. Sierra Wireless has successfully tested - and actually used in Production - several connections to SMS providers. Based on our tests and deployments in many countries around the world, we believe that guaranteed SMS delivery depends on how well the SMS Gateway is connected to the carrier you are using; for large carriers with heterogeneous networking infrastructures it may depend on which sub-network your SIM cards are connected to. The format of the Wake up SMS is binary Wap push, as defined in the OMA DM standard. We know that some carriers do not support SMS messages using this format on their network. For these reasons, the following lists are provided to help you getting started. However we advise you to test your preferred provider supports your actual networking environment. Some Sierra Wireless modules use a simple text SMS format: SL808xT, HL series, Q2698. For these modules, you can also use Twilio to send Wake Up SMS. Refer to the How-to: How to configure AirVantage to send SMS with Twilio?